Yes, yes, I know...resorting to Game of Thrones quotes when we play the Dragons is almost as lazy as referencing 'The Italian Job' every time it's Treviso or Zebre...in my defence I've been listening to the epic tale on Audiobook [I highly recommend it - just the one narrator in Roy Dotrice who uses dozens of different voices - did I mention the guy's 94 years young?] and besides, you can consider yourself lucky I didn't go for my other option which cited both weather and opposition : 'Songs Of Ice And Dire'. The first fifteen minutes of action was all Dragons, and I mean all. After 11 phases around midfield were inching them forward, Gavin Henson showed good sense and technique in slotting a drop goal to give his side an early lead. A tactic you tend to see in the Top14, yet one I'm surprised we don't see more often elsewhere as it makes perfect sense in that situation especially for the away team. After Ross Molony was forced to leave the game early, a nice combination between Henson and Warren got them deep into Leinster territory again and once there we found it very difficult to get the ball back. This time the visitors found the direct approach more fruitful with scrum half Pretorious frequently punishing our forwards for not protecting the breakdown area by sniping up the middle until eventually it was number 8 Benjamin falling over the line. Conversion - from the 15m line on the Anglesea Stand side, no trouble for Henson. Quite the start for the visitors who were 25-point underdogs according to the bookies. Could this be an upset? Ehhhhhh.......not so much. It's true our defence had been badly exposed at the breakdown, but we had yet to really test the Men from Gwent's and once we did, their issues were far worse. Noel Reid skipping through would-be tacklers was the first sign; later it was Ross Byrne who had Gibson-Park in support and while he has taken much flak of late from many, myself included, these broken play situations are where he shines. There was good involvement from Cronin and McFadden along the way but it was the Kiwi who applied the finish. He may not be our best 9 but in a big game where we need a late score he's not a bad guy to have wearing 21. The Dragons began testing us under the high ball but Larmour, McFadden and Ross Byrne were all well able. A scrum pen at halfway was dispatched to touch and from the lineout some crash ball gave us space out wide for McFadden and Fardy to combine out wide before Cronin barrelled his way close to the try line. Finally it was long passes from JGP to O'Loughlin and finally Isa making up for a couple of earlier wayward kicks by dotting down in the corner. Conversion - TG4 offered a great angle of the challenge facing Ross Byrne - he started it left but it fell perfectly over the bar. I thought I'd highlight the conversions in this writeup for a change as our starting outhalf put on a clinic which helped him secure the man of the match award. It was Ed Byrne's turn to find a gap in the Dragons defence and we won a penalty just inside their 22 which was dispatched to touch in the corner. The lineout wasnt clean but Ed got involved again to tidy before eventually it was Josh Murphy getting it down - it took the TMO a few looks to confirm but the right call was made. Conversion - Much simpler location for Ross but he hit it on a similar line to the one previous which showed it was no fluke. Easily pick of the bunch. From the restart we set up a maul which had us instantly on the front foot...then a pass to Jordan Larmour was a bit high yet he made it work before skipping past flailing tacklers and offloading to a steamrolling Sean Cronin. Enter Ross Byrne again who plants a perfect kick pass over to the far touchline for McFadden to recover and he has Deegan in support to provide the finish. An outstanding team try which left fifteen scrambling Dragons in its wake and was well worthy of the bonus point. 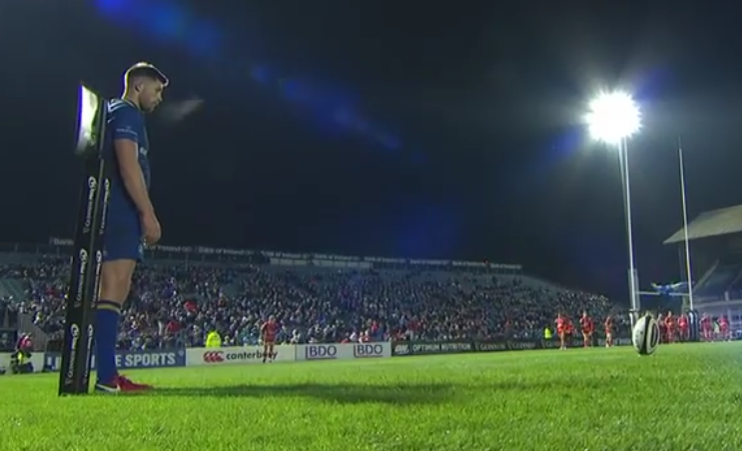 Conversion - About 9m in from the touchline, this time on the Anglesea Stand side, no bother to Ross Byrne. 28-10 was the halftime score. Off a lineout around their 22 we embarked on a series of 13 phases that included more sniping runs by Gibson-Park ably supported by his forwards...eventually the Dragons fullback grasped at a pass from Fardy which went to ground leaving rookie ref Sam Grove-White no choice but to send him to the naughty step. A consultaion with the TMO determined that both Deegan and Nacewa were unmarked beyond O'Brien thus the PT was awarded. Conversion - not necessary under the new laws as a PT is now worth a straight seven points. We had already gone to our bench and Peter Dooley announced his arrival by winning a jackling penalty in his own half - Ross Byrne's touchfinder was superb, getting within about 10m of the Dragons' line. From the lineout we easily stretched the 14-man resistance before Gibson-Park fired a long, fizzed passed [a trademark of our overall display] to Nacewa who gratefully dotted down in the corner. Conversion - Ross Byrne was even closer to the touchline than he was in the first half yet he made the kick look every bit as easy. It'd be generous to call the gap between tries number 6 and 7 a 'purple patch' for the Dragons - it was more of a pale violet as they had much possession which our defence was able to easily keep at arms' length. 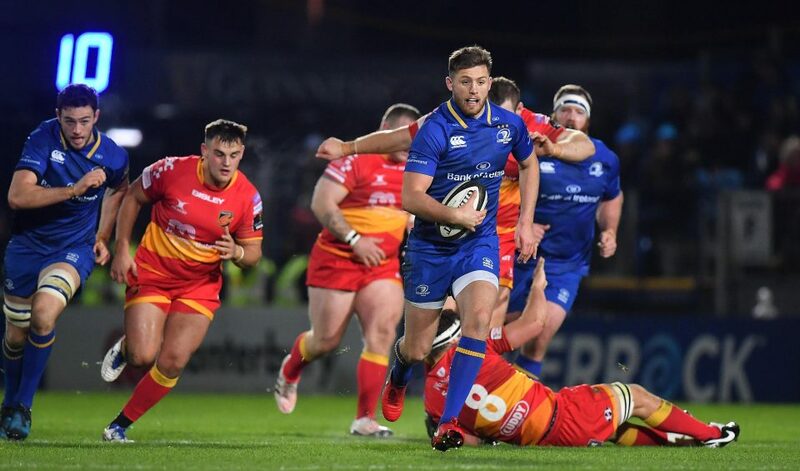 By now Cathal Marsh was on for Ross Byrne and off an attacking lineout he got into their 22 before a cheeky rugby league style jab through by Reid was pounced on by two from either side - eventually the TMO had to admit it was Jordan Larmour who got it down and it was no less than he deserved. Conversion - from a relatively central position Marsh made no mistake with the extra two. After a bit of kick tennis around midfield it was that lad Larmour again stepping up to make something happen, catching one in full flight and proceeding to dance this way and that into the Dragons backfield before selflessly shipping it to O'Loughlin to dot down in the corner. So after a decent start it wasn't the best return to the RDS for Bernard Jackman - I sincerely hope he is given time to make good things happen in Newport, he'll certainly need it. Meanwhile for Leinster as the floodgates were opening at the RDS, there was mixed news coming from Belfast as Treviso came close to upsetting our Conference B rivals Ulster. I say mixed because the home team failing to score four tries meant we gain a point on them, yet the impressive showing by the Italians is bound to give them confidence for our visit to the Stadio di Monigo next weekend.